PARSIPPANY, N.J.--(BUSINESS WIRE)--Wyndham Hotel Group, the world’s largest hotel company, today announced the global launch of its groundbreaking new loyalty program, Wyndham Rewards®, with the debut of a multi-million dollar, integrated umbrella marketing campaign. 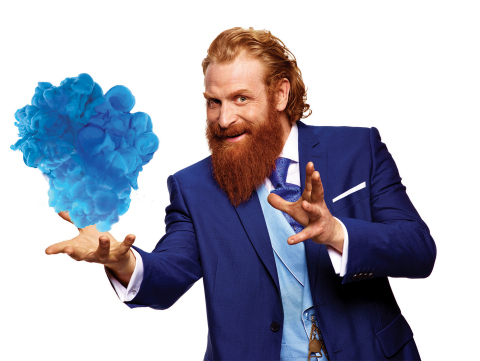 Conceived and produced in partnership with People Ideas & Culture’s Group Company CY&N by PI&C, Wyndham Rewards is investing $100 million in the new campaign, which stars Kristofer Hivju from “Game of Thrones” and “Force Majeure,” and includes playful TV and radio spots, digital media assets and on-property collateral at more than 7,500 hotels worldwide. To celebrate, Wyndham Rewards is kicking-off a summer promotion where members can earn 3,000 bonus points after just one qualified stay, now until September 7th. CY&N by PI&C produced the campaign and assembled a star team, including director Mike Maguire of MJZ who produced the TV shoot, noted costume designer and fashion stylist Mr. Gammon, and photographers Jill Greenberg and Todd Selby for the Wyzard and lifestyle photography. The Wyzard marks the first advertising character ever used by the company in an umbrella marketing campaign. Debuting globally but with a focus on the U.S. and Canada, the campaign includes multiple TV spots on cable networks such as ABC Family, ESPN and TBS, along with significant investments in digital video, radio and unique social media content. The new Wyndham Rewards bucks the current travel industry trend of confusing reward categories by offering members a generous points earning structure along with a flat, free night redemption rate – the first of its kind for a major rewards program. Go FreeSM: With just 15,000 points, members can redeem a free night at any of the program’s more than 7,500 hotels globally with no blackout dates. Go FastSM: Members who want to redeem their points sooner or stay longer for less can book a night at available hotels for just 3,000 points plus cash. Go Get ‘EmSM: For every qualified stay, members now earn 10 points for every dollar spent or a minimum of 1,000 points per stay, whichever is more. For a limited time, members who sign up for a Wyndham Rewards Visa Signature card can take advantage of the brand’s richest bonus offer of up to 45,000 bonus points, or three free nights at any Wyndham Rewards hotel, as well as 15,000 additional points on their account anniversary each year. For more information on the new program and the summer promotion bonus offer, including full terms and conditions, visit www.wyndhamrewards.com. Wyndham Hotel Group is the world’s largest hotel company based on number of hotels and is one of three hospitality business units of Wyndham Worldwide (NYSE:WYN). As both a leading hotel brand franchisor and hotel management services provider, the company’s global portfolio consists of over 7,670 properties and over 667,000 rooms in 70 countries under the following brands: Dolce Hotels and Resorts® (acquired February 2015), Wyndham Grand® Hotels and Resorts, Wyndham Hotels and Resorts®, Wyndham Garden® Hotels, TRYP by Wyndham®, Wingate by Wyndham®, Hawthorn Suites by Wyndham®, Microtel Inn & Suites by Wyndham®, Ramada®, Baymont Inn & Suites®, Days Inn®, Super 8®, Howard Johnson®, Travelodge® and Knights Inn®. Wyndham Rewards, the company’s guest loyalty program offers more than 40 million members the opportunity to earn and redeem points at thousands of hotels across the world. For more information visit www.wyndhamworldwide.com. Wyndham Hotel Group today announced the global launch of its groundbreaking new loyalty program, Wyndham Rewards®, with the debut of a multi-million dollar, integrated umbrella marketing campaign.